There is no greater threat looming over human civilization. We have little power to directly cause national action on climate change, except on particular issues at particular times, such as the fight going on right now over the oil pipeline in Canada. So what do we do? We can’t afford to wait for national change. We need to fight for things that both reduce our emissions locally and put pressure on the national government to help. We need to show positive local impact so that we can demand funding for more. Fortunately, we have a unique opportunity in Seattle. In most cities, transportation and buildings generate the bulk of greenhouse gas emissions. But because we have largely carbon neutral electricity, transportation is by far our single largest source of emissions. Most of the trips we take day to day are to and from work, school, the store, meeting friends—things we could do on great transit. Most of us aren’t carrying anything we need a car or truck for. We’re burning fossil fuels and impacting the climate every time we go nearly anywhere—even most of our buses burn diesel. But how can we move people without burning fossil fuels? There’s a simple way to take a huge bite out of our transportation emissions: electric rail. We’ve already started building a system—but slowly. Far too slowly given the severity of the threat. We need more, and we need a wide variety. Our core lines need to be good enough that people choose them freely over driving. They need to be as good as the best parts of Link—fast and out of traffic. We need subways. 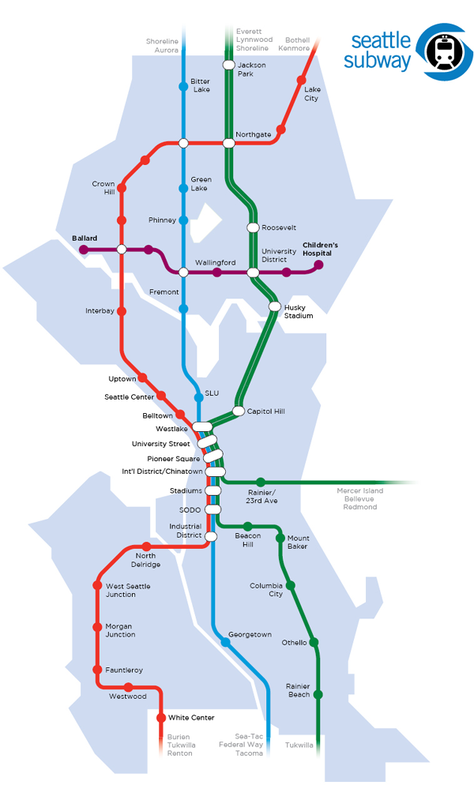 Sound Transit is already building one, but we need it in every neighborhood. When we ask voters for systems like this, they say yes—to a little at a time, as we’ve been building. But we have work to do to show that more and faster, is worth it. Seattle Subway is an grassroots effort to do just that, motivated by the belief that our city will come together to say we need higher quality, higher capacity, faster transit, and we need it as soon as we possibly can if we hope to be successful in keeping our planet habitable. It’s the easiest, highest impact choice for our city. It’s also replicable. When we win measures here, other cities use us as an example, one that can’t be brushed away. We aren’t foreign or different—we’re just like many other American cities, and so our example hits home. If you want to have a chance to keep our planet livable, help us ask for faster, better, higher capacity transit—subway transit. Join Seattle Subway. We’re Seattle’s underground movement. Ben Schiendelman is an organizer who focuses on transit and land use as ways to lead toward sustainability. He has written for Seattle Transit Blog since 2007, and started Seattle Subway last year to drive public opinion and policy toward a sustainable transportation system for our region. ummm, don’t get me wrong, it looks like a great system. but just how quickly can we build this subway? and how does that have any affect on the rest of the outcomes in the world related to fossil fuel consumption or climate change? if you are frightened by the possibilities of climate change or peak oil, preparing our communities for resilience and self-reliance would be far more practical than thinking that our future will only be slightly different because we’ll hop on the subway to get downtown, Redmond or the zoo. (btw, what is the carbon footprint of all that digging and concrete to build our subway?). Subways are city-making machines. They act to concentrate development, which greatly increases density. And it’s density that really will save our region’s carbon footprint. Every home we build inside Seattle represents one home not built out in suburban sprawl, where people drive everywhere, where far more productive land is paved over, where far more resources are used. Every office we build inside Seattle has even greater effects, as it encourages employees to live denser lives. Sure, concrete in tunnels has a high carbon footprint. But think of all of the new roads, driveways, and foundations you’ll end up not building out in suburbia. The question about enviro impacts from construction is entirely fair, as it’s a component ( a developing one, to be sure) to every similar EIS in the future. Road’s projects in the burbs should also receive such similar scrutiny & analysis. Bill’s main question was about time-scale, and it’s a great question. Rail takes so long to build and so long to effect land-use that its impact on the momentum in the climate-change system is diminished. I’ve ended up on the side of rail, despite its slower construction horizon and higher enviro impact compared to trolleys and BRT. It’s much easier to get public support and financing, and rail seems much more effective at stimulating behavior and land-use change. I’m done arguing about mode, and want to get on with route planning and financing. Emergy, sea level and net carbon negatives aside, I’d be concerned about such a large sunk cost in a seismically- and lahar-prone area. Surely it is easier to fix an above-ground system than a buried one. Lahars are a Seattle regional issue, but not so much a city issue. Enumclaw, Kent, Auburn, and Renton would need to be more or less wiped out before it reaches here. Besides, we’re talking about mud. That’s easy enough to dig out of a tunnel. Earthquakes aren’t a large issue for tunnels, especially with a bit of thought in engineering. Keep in mind there’s a hand-dug train tunnel that’s been under Seattle for over 100 years that did just fine during our last earthquake. One nice aspect of tunnels is it greatly reduces maintenance and capital costs in the long run. All of your rail, rolling stock, and stations are protected from rain, sun, and snow. Anyway, I think you’ll find that Seattle Subway would be perfectly happy with elevated rail if that’s the politically acceptable technology. It’s important to connect our neighborhoods with high-frequency, fast transit. How we do that is less important than getting it done. Your aritcle is full of useful information. keep it up. Ben, What motivated you to call this blog “A Subway For Our Climate”, not that the title does not go with the content, I am just wondering. Thank you for the article Ben.